In Greek mythology, it is the River Styx that must be crossed when voyaging from the land of the living to Hades, land of the dead. In Georgian composer Giya Kancheli's work of the same name, the solo viola acts as metaphorical Charon, ferrying what belongs to the present toward what belongs to the past, to memory. It "mediates" between the dead and the living, and it also acts as a go-between for the orchestra and the chorus. The text, chosen more for sound than for meaning, includes the names of Georgian monasteries and churches, and also the names of composers Alfred Schnittke and Avet Terterian, who passed away in the 1990s. As is often the case with Kancheli, the music is predominantly slow and quiet, not really Minimalistic, but at the same time, frugally written, so even small nuances can have a huge impact. At times, however, music of great austerity and purity is shattered by painful, pounding discords. If Kancheli's work were less sincere or more "pop", it might seem kitschy, but Kancheli is nothing if not sincere. He expresses emotions with an honesty – and a strength – that would embarrass many contemporary composers. As Styx represents the interface between life and death, or the portal into memory, Kancheli's music as a whole represents the not easily defined border between faith and disillusionment. Sofia Gubaidulina is the greatest Russian composer at work today – the greatest since Shostakovich. Any new work from her is a major event, and the Viola Concerto (from 1996, actually) is not a disappointment. The concerto's opening, with the soloist's insistence on the notes D and Es (E Flat Major), almost literally invokes the name of Dmitri (e)Shostakovich, a formative influence on the younger composer. The violist and the orchestra share the concerto's sound-world with a string quartet, tuned a quarter-tone lower – a darker "second dimension," in the words of the composer. Here again, the violist travels between and mediates for the two ensembles. The concerto's tone is dark and oppressive, but Gubaidulina's need to communicate with her listeners is unmistakable. She demands their uttermost concentration, but those who make the effort are rewarded by being taken on an emotional journey whose aftereffects are long-lasting and deep. 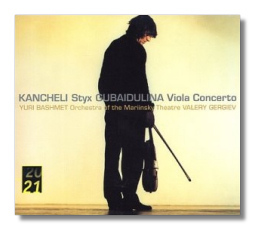 This altogether more dissonant concerto makes an excellent foil for Kancheli's Styx. Bashmet was the dedicatee of both works, and his identification with the music is complete. (DG includes an interesting interview with Bashmet in the booklet.) Gergiev and his excellent forces know no fear. The engineering is dramatically clear, but perhaps a little lacking in depth.